If you don't know already, there are four breeds referred to as "Belgian Sheepdogs" or "Belgian Shepherds" and I am probably the least known, but I am certainly not the least talented. (I am the second from your left in this picture. My friends with me are the three other Belgian Shepherd breeds.) My ancestors were all hard workers with strong guarding instincts and I am pleased to follow in their footsteps. As is the case with any large, strong dog with my type of heritage, obedience training at an early age is a must in order for everyone to be happy to have me as a family member. 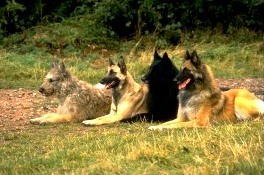 My rich fawn or mahogany colored coat is similar in coloration to my Tervuren friend (far right in this photo), but my coat is shorter and more wiry, requiring less grooming. Exercise should play an important role in my schedule so that I can stay fit and healthy. When fully grown, I am between 22 and 26 inches tall (55.9 to 66 centimeters) and I weigh about 62 pounds (27.9 kilograms). We have no Belgian Malinois Breeders listed at this time. Click here to place your Belgian Malinois Ad!